Wikipedia has the great article dedicated to Russian superstitions and traditions. Some are extremely common and practiced by the vast majority of the population, while some are extremely obscure. Many of Russian superstitions are deeply rooted in the Slavic mythology (paganism), practiced by the Slavs before Christianity. Before leaving for a long journey, travelers and all those who are seeing them off, must sit for a moment in silence before leaving the house. It is often conveniently written off as a time to sit and think of anything one may have forgotten. Knocking on wood is practiced in Russia as in other countries. However Russians tend to add a symbolic three spits over one’s left shoulder (or simply with the head turned to the left), and Russians will often knock three times as well. Traditionally one was spitting on the devil (who is always on the left). Breaking a mirror is considered bad luck in Russia, as is looking at one’s reflection in a broken mirror, but the effect is also more severe than 7 years of bad luck (as in American culture). On examination day, it is bad luck to make your bed, wear anything new, or cut your fingernails. If one person accidentally steps on another person’s foot, it is common for the person who was stepped on to lightly step on the foot of the person who stepped first. It is said that they thus avoid a future conflict. Birthday parties should be celebrated on or after one’s birthday, not before. So when one’s birthday falls during the week, it’s best to celebrate the following weekend. And never give someone birthday wishes before their birthday. Talking about future success, especially boasting about it, is considered bad luck. It is considered better to be silent until the success has been achieved or to even sound pessimistic. Returning home for forgotten things is a bad omen. It is better to leave it behind, but if returning is necessary, one should look in the mirror before leaving the house again. Otherwise the journey will be bad. Many Russians consider giving gifts of sharp objects, like knives or scissors, to be taboo. This taboo may be avoided by the donor taking a symbolic payment, for example one Russian ruble, in exchange as if it is a trade, not a gift. Birds that land on a windowsill should be chased away. If they tap on the window, or fly into it (open or closed) it is considered a very bad omen (often of death). If a chicken crows at you three times before noon, the death of a close family member can be expected within a fortnight. The chicken should be killed, but not eaten, as consuming it will bring about further misfortune. Things bought for a newborn baby (such as clothes, toys, furniture, etc.) should only be purchased after the baby is born. This is usually done in a big hurry. It is often considered taboo to step over people, or parts of their body, who are on the ground. It is often said that it will prevent the person from growing (if they are not fully grown already). It is better to politely ask the person to move or to find a way around them. If one accidentally steps over a person (or people), it is sometimes standard to step backwards over them. Unmarried people should not sit at the corner of the table. Otherwise they will not marry. This mostly applies to girls, and often only young girls. Sometimes it is said that the affected individual will not marry for 7 years, making it all right for young children to sit there. When giving an animal as a gift (a cat, dog, bird, etc. ), the receiver should give the giver a symbolic sum of money, for example one Russian ruble. A purse (or any other money holder) as a gift requires a little money inside. Given empty it is said to cause bad financial luck. A funeral procession brings good luck. But one should never cross its path or it is bad luck. A woman with empty water buckets coming towards you is considered a bad omen. A group of two or more people should not walk on different sides of a tree. They should all keep to one side or the other. Bread should only be cut with a knife, not with your hands. Otherwise, it is said, that your life will be broken. The opposite is held true by some people. Two or more people should never use one towel at the same time to dry their hands or bodies, or it is said to bring conflict. A stranger should not look at a newborn baby before it is a certain age (between two months and one year). If one looks at the baby it is considered bad luck to compliment it. Instead, one could say, “Oh, what an ugly child!”. One should never hand a knife directly to another person, as it is said that the two will get into a fight. Instead a person should always place the knife down on a surface, and only then can the other person pick it up. In several cases you can give it directly, but only pointing the sharp end to yourself and making the knife’s handle accessible for the opposite person. One is to never lick food off a knife. Doing so will make you a cruel person. If one feels that he or she may have been cursed by someone (had the “evil eye” put on them) or just has the feeling of a hostile presence, it is recommended to remove one’s coat and then put it back on starting with the hand opposing the usually used one. It is also recommended to pin a French Pin inside your clothing to avoid the curse of the evil eye in the first place. One should not shake hands or give something through a threshold. Whistling in a house would bring misfortune to that household. It is considered taboo to give something that is broken or has a defect as a gift. Before one takes an exam, someone else would say, “ни пуха ни пера!” which roughly translates to “neither fur, nor feather!” which means good luck. To this, the one taking the exam would reply, “К чёрту!” which means, “Go to the Devil!” or “To the Devil!” which is a way of securing good luck. If one walks underneath or ducks under the arm of another person, he or she must go back underneath that person’s arm. Otherwise, he or she will never grow to full height. The latecomer must drink a full glass. Outgoing guest must drink last glass, so-called “na pososhok” (russ. “На посошок”). Literally it is translated “On a small staff”, really means “For lucky way”. It is considered bad luck to put an empty bottle back on the table when it’s finished. If your ears or cheeks are hot, someone is thinking or talking about you. If your nose itches, you’ll be drinking soon. For children they might say, “You’ll get hit in the nose”. If your right eye itches, you’re going to be happy soon. If your left eye itches, you’ll be sad. If your lips itch, you’ll be kissing someone soon. If your right hand itches, you’re going to get money soon. It sometimes means you’re going to greet someone. If your left hand itches, you’re going to give someone money. If you have the hiccups, someone is remembering you at this moment. If an eyelash falls out you’ll receive a gift. If someone finds an eyelash on someone he or she will sometimes let the person blow it away and make a wish. If a fork or spoon falls on the ground, expect a female guest. If a knife falls, expect a male guest. If you eat from a knife, you’ll be “angry like a dog”. If someone is not recognized when seen or heard, he or she will be rich. So if someone calls you on the phone and you don’t recognize them you can cheer them up by telling them they’ll be rich. If someone was talking about you before you entered the room/conversation, then you will live a long and rich life. If a cat is washing its face, expect guests soon. 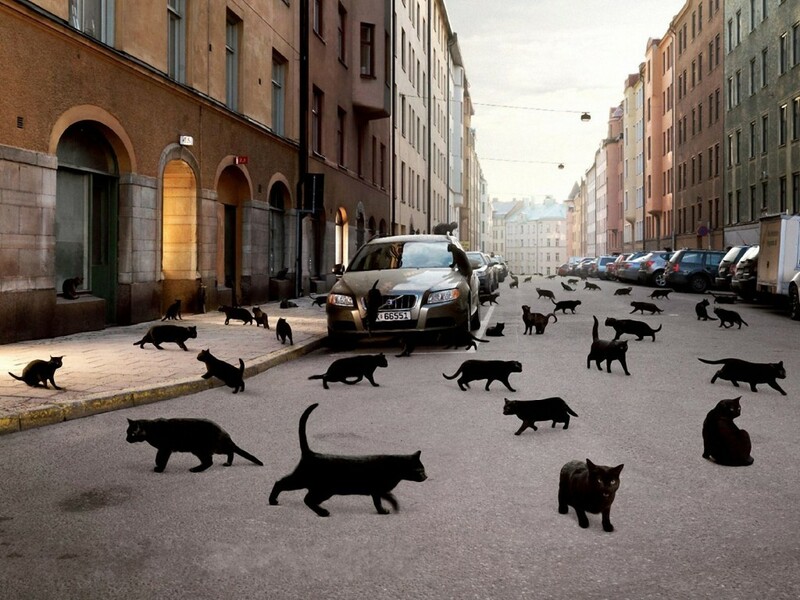 If a black cat crosses your path, it’s bad luck (though not unique to Russian tradition). People will often avoid crossing the place where it crossed, or will at least wait for someone else to cross it first. If a hare crosses your path, it’s bad luck. This is much less common than the cat superstition, which is understandable given the lack of hares in urban conditions. If you spill salt, it’s bad luck and is said to bring conflict, but no one will throw salt over their left shoulder. If you step on a crack, it’s bad luck. This one isn’t very common, and Russians who do avoid cracks don’t do it in an effort to save his or her mother’s backs. If it’s raining when you leave a place, it means you’ll return, and it is considered a generally good omen. If it rains on someone’s wedding, it means they’ll be wealthy. If someone sneezes while telling something, it means he or she is telling the truth. If one or more birds defecate on you or your property (commonly cars), it’s good luck, and may bring you riches. Lucky in cards not lucky in love. This, however, is only a pre-marital superstition. The reason for the division is that marriage is a sacrament in the Russian Orthodox Church, and this sacrament, ordained by God, eviscerates the pre-marital superstition. Thus, when a man is bonded by divine sacrament to a single woman whom he loves the cause and effect is reversed: namely, his married love for a single woman, and her love for him, will bring him good fortune in all endeavors including cards. If you wear a shirt backwards, you will become acquainted with someone new. In Russian superstition if a couple sets a wedding date and doesn’t end up getting married on that date they can not set another date and should not get married as their union will be cursed. If you have ringing in one of your ears, ask someone which ear is ringing. If they guessed right, you should both make a wish. If someone does something bad, a ghost may take a possession owned by the family. If the sinner repents, the ghost will return the item sometime during the week of his or her birthday. If someone whistles inside a house, they will become fiscally irresponsible and lose money. If you find yourself standing between people with identical names, you should make a wish and it will come true. especially happy when ever I actually discover blogs that are well-written and well-researched.